...and some tips for controlling your smart home. What makes a speaker smart? I know I didn’t need to say thank you to a talking speaker, it just felt right. I have been testing out various smart speakers in my house for the past couple weeks, and their abilities have me feeling grateful. When smart speakers first appeared, I didn’t understand the appeal. I am someone who would rather type something into my phone than ask Siri. It always felt more precise that way. Did my opinion change after spending several weeks with smart speakers? Absolutely. This is the kind of technology I saw in Star Trek growing up. Except now it actually exists! I was surprised at how intuitive both the Alexa and Google Assistant platforms are. Within hours I was communicating with them as if it was second nature. Alexa responds to more than 50,000 commands. 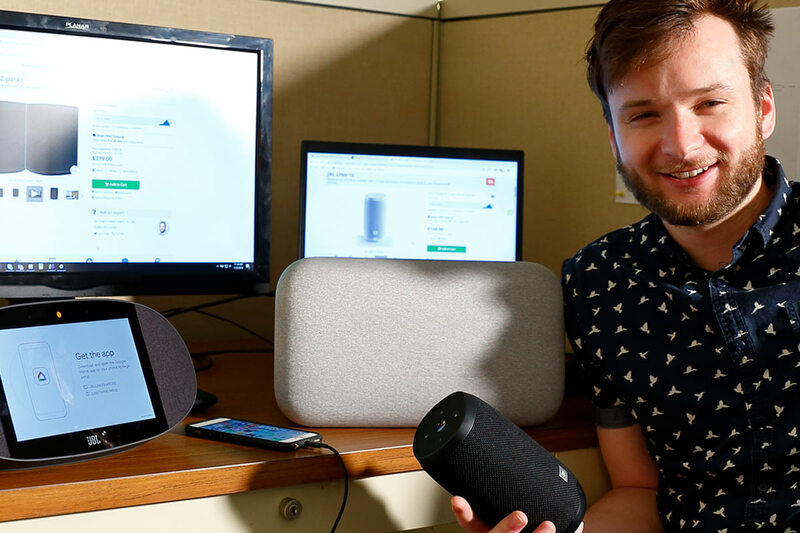 Both Amazon and Google are pouring tons of resources into voice control technology, which means these smart speakers update frequently with new skills. One of the biggest reasons to purchase a smart speaker is to use it as a controller for smart home devices. Amazon claims Alexa is compatible with over 20,000 devices, most of which will also work on Google Assistant. One of the coolest things smart speakers can do is to initiate smart home “routines.” This is when you program a series of skills to a certain voice command. For example, “Morning routine” could call up the daily weather report, feed your dog, and start your smart coffee machine. “Leaving” could turn off your lights, turn down the thermostat, and lock your house. To determine the best smart speakers for 2019, I ran several popular voice-controlled speakers through a series of tests. For me, the most important factors of a smart speaker are functionality, design, build quality and sound. With those considered, these are the smart speakers that stood out among the pack. 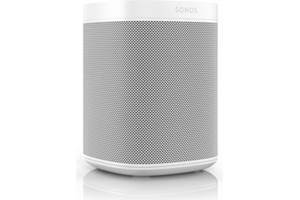 I was excited to try out the Sonos One, as it's one of the most popular speakers with our advisors and customers. The speaker is sleek, with a high-quality feel. I got the sense it's built to impress for a long time. It's even humidity-resistant, making it safe for restrooms and steamy kitchens. But sound is the real reason you want to invest in the Sonos One. All the subtle details of the instruments and vocals come across crystal clear. I was especially impressed with the sweet treble it produces. The mids also have a sensational tightness to them. Complex indie rock bands like The National and Arcade Fire were reproduced with brilliant detail. Sonos didn’t become the most popular wireless multi-room music system just for its sound quality. It's also known for an outstanding user experience. How does the experience transfer to voice control? Pretty seamlessly, as far as I can tell. From the top controls, to the Sonos App, to the Alexa voice control, I did not encounter any issues. Overall it’s a responsive, well-built speaker, with great sound quality for the money. This is a no-brainer for people who already own Sonos speakers or are seeking a voice controlled building block for multi-room audio. 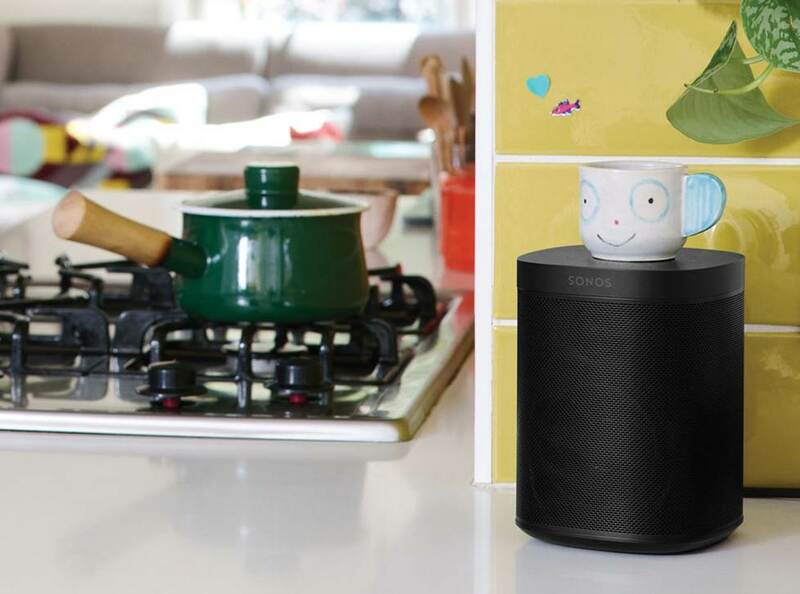 Sonos recently started rolling out the 2nd generation of the Sonos One. These come with an upgrade to the processor and memory, as well as the addition of Bluetooth Low Energy. Overall, they will compute a little quicker, but there is no difference in sound quality. Read all our customer reviews. The sound is excellent. This was my fourth one, and it is great to be able to walk throughout the house and hear my music. A smart display is a smart speaker with a built-in touchscreen. Ideal for the kitchen, you can use one to pull up recipes and cooking tutorials. Use the built-in camera for video messaging. 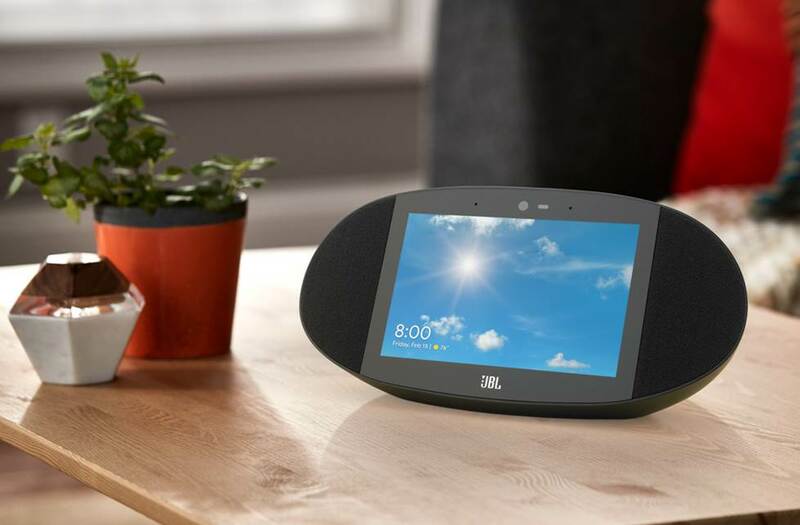 If you are planning to use a smart display for videos and music, we recommend the JBL LINK VIEW. The JBL LINK VIEW is the consensus best-sounding smart display you can buy today. 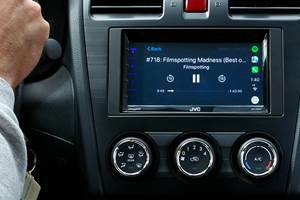 The design and build prioritize the speaker system much more than the other smart displays currently on the market. It contains two 2" full-range drivers that deliver surprisingly robust performance. Listening to the upbeat “SGL” by Now, Now was an ear-opening experience. The bass line was punchy, front and center, without muddling any of the other components of the song. It was remarkably groovy. The obvious benefit is the touchscreen display. As natural as I found the smart speaker experience, I'm still a visual learner. Being able to see the weather, news, and calendar as the information was recited to me made this one of my favorite products in terms of smart home integration. For instance, asking the JBL LINK VIEW to turn on a Philips Hue light automatically activates a Hue control panel on your touchscreen. As mentioned, Smart displays are great for kitchen use. The recipe presentations make cooking easier and more enjoyable. It’s also convenient to ask Google Assistant “How do you cut a mango?” and then see a tutorial in seconds. This is an ideal option for people who want more control and visualization than a typical smart speaker would offer. Crutchfield’s own Ralph Graves was highly impressed with the smart capabilities of the display. If you are looking for a basic smart speaker at an entry level price, we recommend the JBL LINK 10. The built-in battery is what separates the LINK 10, allowing it to double as a portable Bluetooth speaker. 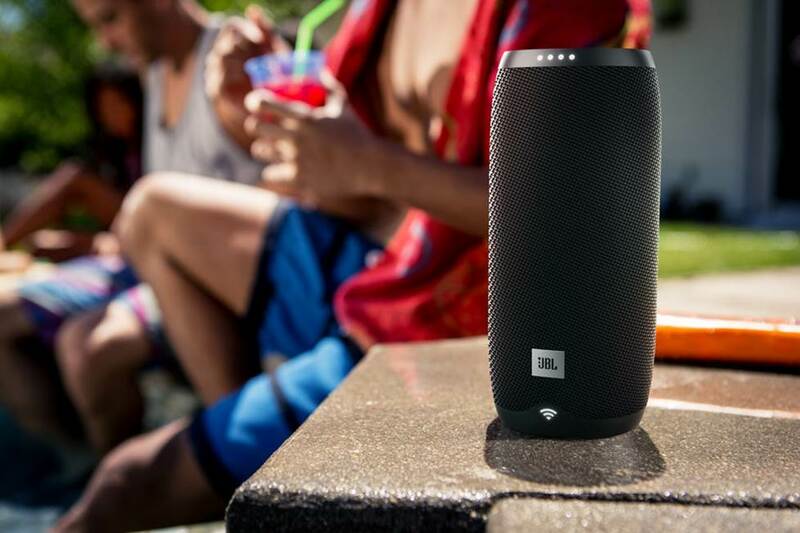 The JBL LINK 10 has a simple and clean design. It’s light, but feels solid. The buttons have a satisfying click to them. The speaker is immune to water splashes and is rated to withstand immersion up to 1 meter, which makes it risk-free for kitchen, bathroom, or poolside use. The JBL LINK 10 gets plenty loud for its size. It has omnidirectional 360-degree sound, which helps it to fill a medium-sized room with ease. The treble is light and balanced well. The mid-range is tight. I've been using the LINK 10 to listen to podcasts, since it’s easy to carry from room to room. I listen to a lot of comedy podcasts. The sound on the LINK 10 is rich enough that I can often hear the mics pick up the engineer laughing from behind the glass. This is a great entry-level smart speaker for people looking to get started with smart home technology. Read all of our customer reviews. This is an outstanding little treasure in my opinion. If you want the casting abilities of Google home but want higher fidelity in the music, get this. The Google Home Max is an absolute monster. Weighing in at nearly 12 lbs., this speaker is designed to take the volume… well… to the max. I'm constantly setting mine at just 25 percent to make sure it doesn’t disturb the neighbors I share a wall with. I enjoy the minimalist design. The frame fits in well with my room, while the four backlit dots give it a futuristic feel. The basic top controls are responsive, although I rarely used them. It comes with a handy silicone mat to attach to the bottom so the bass vibrations don't rattle the surface it lays on. I could not be more impressed with the sound. For a smart speaker, it’s as good as it gets. The tones are well-balanced and exceedingly rich. When I listened to a couple of live acoustic performances, it felt like the singer and the guitar were in the room with me. On the other end of the spectrum, it made booming, highly-produced banger pop songs like “Perfect Places” by Lorde and “Girls Just Want to Have Fun” by Cyndi Lauper transcendent. Google has clearly tuned the speaker to emphasize the low and high ends, and you won’t hear me complaining about it. 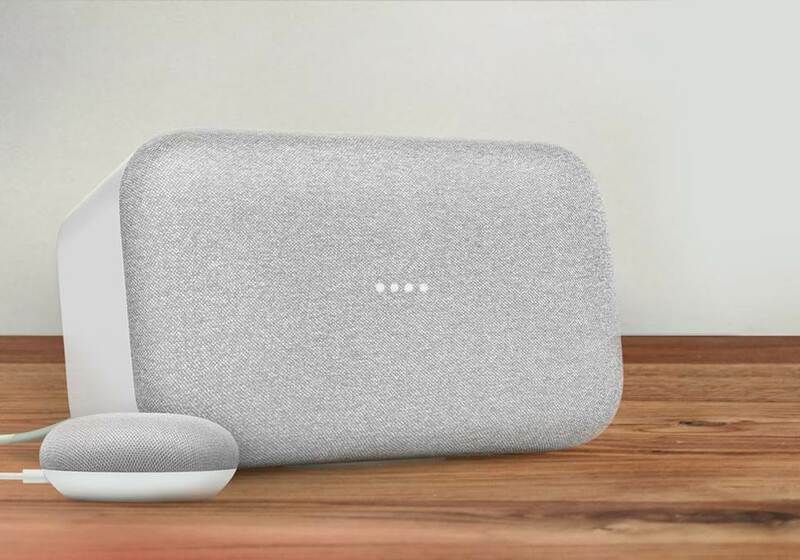 The Google Home Max comes with Chromecast audio built-in. This allows it to connect over Wi-Fi to any other devices with this feature. This is a great item for people who want a smart speaker with lush, layered sound. It can also serve as a party speaker. Our advisors can help you find the perfect speakers to meet your needs. If you have any questions, call, email, or chat with us today. We provide free lifetime tech support on every purchase. Here's to a smarter 2019! I too would have like to hear how the HomePod compares (in sound quality) to the others. Why didn't you include the Apple HomePod in your review. I happen to think it one of the best sounding smart speakers.